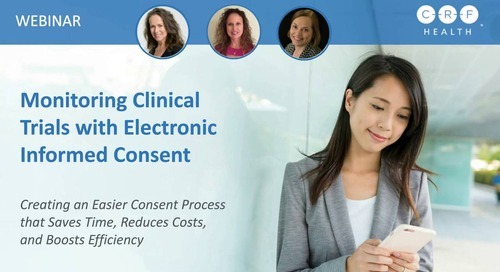 CRF Health's State of eConsent 2017 Report surveyed 100 biotech, pharmaceutical, CRO, and IRB organizations who shared their opinions on Electronic Informed Consent (eConsent). 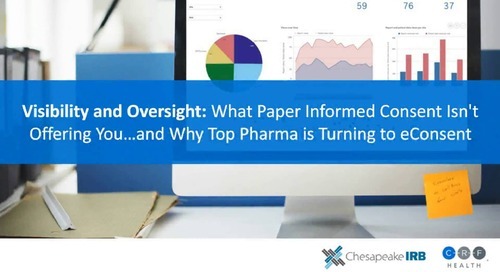 During this webinar, industry expert, Sandra "Sam" Sather, Regulatory and Quality Lead for TrialConsentTM at CRF Health, discusses the results. Welcome to today’s XTalks webinar. Today’s talk is entitled Electronic Informed Consent 2017 Industry Survey Results. My name is Andrew Jordan, and I’ll be your XTalks host for today. Now I’d like to introduce our speakers for this webinar. Sam Sather’s current focus of consulting is to promote clinical quality systems for sponsors and CROs and investigators and clinical research institutions. She has over 30 years of clinical experience, a Bachelor of Science degree in Nursing and a Master of Science degree in Education, with a specialization in training and performance improvement. Sam has served many roles in clinical research, including site study coordinator and manager, sponsor and CRO monitor, quality assurance auditor, risk manager, trainer, and performance management consultant. All right, and your first speaker for today, Naor Chazan, leads the global marketing team at CRF Health and is passionate about developing educational content to help their customers excel at planning, deploying, and managing their clinical trials. He’s been a B2B marketer for 11 years, the last six of which have been in the life sciences industry, and holds a Bachelor of Science and Marketing from Rutgers Business School, along with a marketing strategy certification from Cornell University. And now it’s my pleasure to hand the microphone and the presentation over to your first speaker for today, and that’s Naor. Hey, good morning, good afternoon everybody, and thank you very much for joining us today. I’m pretty excited about this webinar. We’re going to be revealing some pretty interesting insights from some of our industry research. But first I want to just kind of get everybody on the same page because surprisingly there is some misinformation, as eConsent is relatively new. So, really quickly, what is eConsent? For our purposes we are going to refer to the use of electronic systems and processes that may employ multiple electronic media to convey information related to the study, and of course to obtain and document informed consent from your participants. In our case, multimedia, for an eConsent can include any of these following: text, graphics, audio, video, podcast, and so forth. 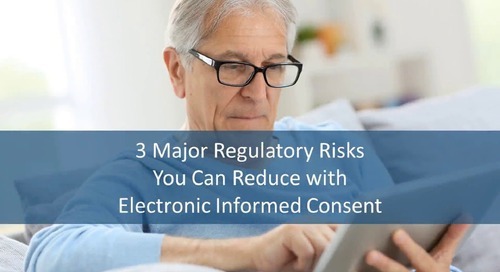 We get this from the FDA and their latest guidance on electronic informed consent. So when we refer to eConsent, this is exactly what we mean. Andrew is going to pull up a poll real quick to just sort of gauge the audience and see what your experience as an organization is with electronic informed consent. That’s right. So that polling question is appearing on your screen right now. How much experience does your organization have with electronic informed consent, like Naor said. And your options there. E-Consent is not currently used by my organization. Maybe you have some, so talking one to three studies. Intermediate, maybe four through eight studies. Advanced, so nine or more studies. Or maybe you’re not sure about that. Looks like most of you have voted on this question, thanks for doing so. We’ll close polling now and share the results with everyone. Fifty-five percent of you are saying eConsent is not currently used by your organization. Sixteen percent saying some. Fifteen percent saying you’re not sure. Nine percent saying you’re intermediate. And just five percent are advanced on that. So with that, Naor, I’ll hand the mic back to you. Thanks. Sam, I’m wondering if you have any feedback on those results, if they mirror sort of what you’ve heard in the marketplace over the last several years that we’ve been working on eConsent development. It definitely does, and I think that you’re going to see from some of the results from our survey that we go over, it’s going to be quite similar. So I’ll definitely talk to what the changes have been from even last year to now and what we’re going to be seeing that we think in the next three years. Great. So I wanted to set the stage real quick. We have been working on eConsent development as part of TrialMax and our new product, TrialConsent, for quite some time. And really the reason is, eConsent is becoming incredibly popular. It’s sort of the new buzzword, it’s the latest technology that’s really poised to make a difference. On the screen here, you see that, based on our research already, 100% of the top ten pharma have an eConsent initiative in place. And as we go down the line into the top 25 and the top 50, it’s really becoming something that is a big key initiative for a lot of the top pharmaceutical organizations throughout the world. And I think that we’re only going to see these numbers increase and increase as early adopters begin to put out some results and that we begin to socialize some of the findings and the benefits of using electronic in our informed consent process. So we had a 2017, what we called a State of eConsent Survey. We have been working on TrialConsent for an incredibly long time, and we’ve done lots of research with consultants and sites and sponsors and IRBs. And one of the things that we wanted to do was actually formalize a survey that we could share with our customers and prospective customers on some of the things that are sort of interesting. We noticed that there was really no such survey in existence, so we polled our database at CRF Health. We had 146 respondents from a whopping hundred biotech, pharma, CRO, even some IRBs in there. And our goal was to benchmark some of the current eConsent use. We wanted to learn about the experiences and expectations of an eConsent solution. We also wanted to understand adoption hurdles and some of the challenges, and of course to project the future of eConsent growth. And our intention is to do this survey the following year and the next year, so that we can share these results with you and have a way to track the growth of this new technology. So let’s talk about our findings. I’m going to just talk briefly about some of the demographics relating to the findings, and then Sam is going to talk about the rest of the survey and the results. So from a job role perspective, 44%, the majority here, work in clinical operations. Sixteen percent were in executive leadership. Eleven percent in clinical sciences, which would incorporate things like medical directors and folks actually working in protocol. And eight percent in data management. And then we had a whole bunch of others, 21%, that didn’t fit into these personas. As far as therapeutic area experience, obviously this sort of mimics what we see in the field in general, you know, lot of people in oncology and cardio as the most common therapeutic areas. Obviously there’s a lot of trials in those areas. Obviously these don’t add up to 100, because you’re allowed to multi-select. But just to show you the depth of the respondent experience really through a wide variety of therapeutic area expertise, and that’s what we wanted to make sure that we covered as much of that in our results. So Sam, I’m going to pass it over to you. Yeah, thank you. So when it comes to the experience with eConsent, for those that responded to our survey, quite similar to the group that’s on the call today. And we think that’s a pretty accurate example of where the current market is, related to especially operationalizing eConsent. So when you think about the impact that informed consent has on a clinical trial, the implementation does take some impact analysis, some updates to procedures. It might even be where you’re planning, piloting, all sorts of things. And the other thing that’s interesting about why I think, and why CRF Health thinks, that we see these types of statistics is, who initiates eConsent can come from different types of stakeholders. So it can come not just from the sponsor, but we really foresee that the initiation of eConsent can definitely be coming from the ethics committees, and definitely the research sites. Like Naor said, we’ve been working with eConsent for a long time, and I remember when we first were getting stakeholder feedback, and we were presenting out in the field, our first presentation ever was to an academic medical center, so we started really with the group that one, will use it with the participants, but even more so, this is the group that runs thousands of their own trials. So the market, there’s just so much potential to be in many many different places. So as you can see here, you see that for this survey, we had over 50% that they’re not currently using it. And you’ll see later how many about the planning of it, and the kinds of differences. But notice that those that are, we’re seeing early adaption and adoption, so it’s one to three studies. We have a few advanced groups out there too, and some of it is depending on the kinds of studies you do. And there is just so much that we could share as we go through these slides, so pretty excited. And then, so here’s the idea of okay, what is the outlook. If you were, in the opinion of the surveyors, to predict the future of eConsent adoption for their organization. And you can see that, in the current 12 months—and to me this is very much reflecting the amount of time it takes to implement eConsent into a clinical operation, into your quality systems. But look what happens within one to two years. We have a significant increase in the predictability that the organizations will be using, and then again even in three years. So those that are working more in the strategic areas, like executive leadership, those that are planning studies, are definitely responding more optimistic about eConsent. And the clinical operations groups, the groups that have to then put it into their day to day, this is where it does take more time, so that we just—again, it’s a lot to do with all the different stakeholders that are involved in consenting. And also it brings with it quite different types of regulation. There’s definitely the clinical trial GCP regs. But coming into eConsent we also have the regulations related to protected health information. So what is driving the interest of electronic consent? So the survey was really interesting, and this is something that I can say I’ve probably demoed hundreds of different presentations on eConsent. And with that comes lots of lots of Q&A, and I can tell where the real interest is. Some of the stakeholders that answered this survey, depending on what their interest is—is it patient centricity or is it budgetary types of conservation. So what we do see though, again and again, is that we need to do something to enhance the understanding of the consent forms. And this is right in line with the changing regulation around the world about consent. Regulatory bodies around the world are starting to mandate that consents are shorter, that they are more concise, that they can’t be these 30-40 pages, and they need to be more informing. Well we know that paper has really failed to do that. So the biggest thing we see that’s driving the interest is definitely enhancing the understanding of the consent. Now, what’s driving interest is, it’s really interesting to see that, coming in here is also looking at the reduced cost. There is also, you’ll see coming up in a slide or two, that one of the barriers might be the fear of cost of electronic consent. But in reality, when you think about what does paper cost us, we do find that sometimes when we’re meeting that people will say, oh paper is free. But it absolutely is not free, you know. Think about all of the coordination and the archiving and especially the issues paper brings with it with compliance management and regioning, etc. So we do know that the ability to help people understand, and technology can absolutely help that. Now, one thing that was surprising to us that didn’t come out stronger, but we have seen this actually in our presentations and some of our sales, is that what we thought was going to be the big ticket was remote consent. And not that it’s not important, but we’re really seeing the adoption coming on site first, for sure, and popularity in the movement. The other thing is, remote monitoring was stated kind of less as interest, not that it didn’t actually score here, but it’s not again the biggest driver. And it might be that there’s some of the concerns of the barriers of reviewing protected health information. You can definitely set your system up to remote review certain types of data and/or, depending on the region of the world and the institution and what are the local regulations, you can do also the review of PHI. So yeah, lots of considerations, they’re very interesting data. So the next sections of the survey, we looked at functionality. We want to know, related to certain topical functionality, what was the biggest drivers for responders. So related to design and deployment of functionalities of eConsent, and what really came out strongest is the ability to deploy something, you know, really again on site, on the tablet. And the other thing that I think was really really really important here is—you know, and it relates to one of the barriers of eConsent—is when we introduce technology into clinical trials, there becomes sometimes a dependence upon the vendor that is servicing that. And that can lead to fears of delays and/or cost increases. So the idea of a system that supports the developers of the consent from the clinical trial team to be able to just do it yourself, that really was something that we saw as—for the ability of the study team to easily create these consents, it really came in second and really close second as something that was highly valuable. And then, we see definitely the ability to make translations more easy. When it comes to the functionality related to participant engagement, and remember it’s very very valuable to the survey respondents that we help people understand the information being presented, is really again that interactivity with the participant. So we have seen mentioned in FDA’s guidance document, but also within some of the other recommendations from some other groups out there related to eConsent, is that the knowledge checking or—it’s not so much like a quiz like you would in an eLearning, but it’s as you present information, pausing at points that make sense to stop and ask to check someone’s comprehension. So typically, you can place these knowledge checks, not directly after the information’s presented, so you’re not just regurgitating information, but as they start to go further in the consent, asking some of those key things that are the most critical things that you want them to remember, either for ethically and also informing the participants so they understand for example it’s voluntary that they consent, and they can withdraw at any time. And/or what are the key things in your consent form related to the protocol that if someone doesn’t understand will affect the retention of that individual and/or for the compliance and how your data is, and how they perform. So this is why this is such a valuable thing, and we saw it in our survey. Another was the other types of interactivity with the participants, like the ability for them to indicate where they have questions, and tracking the interaction between the site and the participant or the patient. Now it was interesting that the attractive user interface for the participant came in second here. And we do have to be careful that the eConsent is presented in more an emotionally neutral type of presentation, so it’s not a sales technique to get them to think, ah this study is going to be fun and having a lot of balloons and thumbs-ups and all those kinds of things, great job you consented. We have to be careful with those things, and we know that the FDA’s guidance document talks about kind of the oversight that the IRB has related to some of these things. Now, top reporting functionalities. So then we asked, okay, thinking about certain types of functionality, how do you grade these? What’s the top supported functionalities. And here again, the understanding of what parts of the consent the patient had questions about really came in very high, 92%. As well as, as I mentioned just previously, is what parts of the consent do they not understand, so that they can be discussed with the study team from the site prior to signing. So you need to have a system that facilitates that flow and also can reconstruct and show that this occurred. So it’s not just having a participant indicate where they had questions, but it is also when you were to see the journal that comes from what some people call the audit trail of these consents, is the time that was spent on certain sections, where they had questions, and is there any kind of facilitation where the participant indicates that since they had that question, they got to talk to somebody and they feel confident to move forward. Then, you know, it’s really a neat thing, this whole interactive piece. You can see top reported functionalities all within that type of participant focused, patient centric type of thing. Now, when it comes to the benefits—and we’ll look at some of the barriers after this too—but you know, we asked the survey participants to rank the eConsent benefits. So it was on a scale of like one to four for these, one being something that you rank the highest, most valuable. And when we look at this is really interesting because you can see earlier the feature functionality was really, what was most important to our survey respondents were helping the participant understand. But when it came to really benefits of eConsent, we’re looking at compliance to study procedures, really was ranked number one, and pretty strongly as well. The other thing is, feeling that because we’re supporting participants better, what came in second was the increase in number of study participants. And also right behind it was retention. And so we know that eConsent, we’ve heard a lot about recruitment and retention, but we also want better recruited individuals. So hopefully this better understanding will not only help people stay in the trial but also really do that first one ranked here, to increase compliance to the study protocol. And then last came in, minimize the time spent with the site staff. 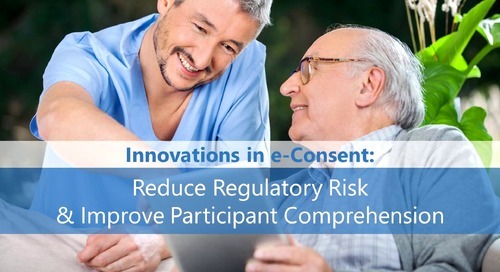 Now, one thing that we know that eConsent is not supposed to substitute the conversation that goes on and the interaction with the site, especially in the trials that in some countries and some regions it’s a requirement. You know, it’s a simple marketing study where they’re going to be doing a questionnaire, maybe you don’t need the site conversation with medical questions being answered. But in most of our clinical trials, we’re looking for that proof that this occurred. So it’s minimizing the staff time, so when they’re reviewing they can do other things. But again, we still need to, when you implement this, make sure the system is facilitating that interaction for sure. So when it comes to return on investment for the eConsent use, we can tell from the survey respondents that we need more time in the industry with eConsent. There’s just been not enough data for those that have actually been using it. And remember from our survey respondents, about half had not used eConsent yet. So the value of the sample size for this with this question is smaller. Now for the respondents, though, that had used eConsent before, they really most of them said, again, it’s too early to tell what the return on investment will be. But we do have, again, a 20% response rate that yes, they had a positive return on investment. You know, and one thing I really want to encouraging those of you that are implementing or have implemented or are thinking about it or getting close, is as you set up your study, make sure you set up the study to collect data about the eConsent and your return on investment. But also look at retention and recruitment. So to compare an eConsent study to a previous study is very hard. It’s probably, you know—the study design, not really strong. But if we were—think about how you could potentially, if you did a pilot, could you do some sites with eConsent, some sites without. And might it be a regional thing, and even that becomes not apples to apples because of different regulations. But we really do need more and more information, and we will get it as it gets to be more and more commonplace, just like electronic data capture and eCOA, we just have more information. So think about how you’re going to be setting up your pilots, etc. to be able to get this information to be valuable and hopefully share it with the industry. And there is a movement with TransCelerate Biopharma, one of their initiatives is eConsent, and they’ve done a survey but also presenting a guideline. And I, just like CRF Health and also some other groups, we will continue to survey the industry to get more and more information, so hopefully you maybe can share what we find. Now when it comes to barriers of implementing eConsent—and a lot of these are not known yet because of we’re just starting to be using it—the cost concern is the single biggest hurdle from our respondents. Now, one of the things to think of, just like electronic data capture, is the up-front cost is always greater than the savings at the end. So if you could look at the amount of cost it takes you related to the negativity of not having added consent or doing kappas and compliance management for problems with consent, I audited and monitored for years, and much of my work with sites was issues with consent. Much, if not 80%, of the issues with consent can really be eliminated with eConsent. Using the wrong version, having incomplete consent, the wrong people consenting someone, not having the right person consenting there, those types of things. A lot of this we can help reconstruct and really do quite a bit of elimination of some issues. Now, when it comes to other types of barriers, is regulatory concerns. And this is something that we know that the United States is ahead of the game in mainly two reasons. One is the regulatory authorities have put out guidance, and not just the FDA but also the Office for Human Research Protection for government funded studies. Instead of a single guideline, a mutual guideline has been released together. The other thing that really has helped the United States is the ethics committees are pretty positive if not—I would say the majority have actually used and been involved in studies with eConsent, so they’ve got experience. So they’ve had to look at how they would implement it within their quality systems and kind of change their practices, right. And then, I’m not saying Canada might not be right there too, but especially wherever there’s close proximity of some experience. When it comes to other types of barriers, definitely think of when it comes to electronic signatures, and there are some things that are still being defined as best practices within eConsent related to how someone should sign and if they’re signing on an electronic device and not necessarily biometrics or less kind of signature, does it equal that of if we’ve identified the patient and linked them to the experience, is this something that is a legal consent, right. So we are needing to get much more interface and comments and experience with local regulations and regional regulations around the world. And there are actually continuing plans for every one of these things because eConsent can be done on a partial basis where you can add paper signed consent so they can go to an electronic review, which is very very valuable again if you’re trying to support how people learn and get presented information, you’ve really got again that electronic experience that even if they have to sign the paper. The challenge will be again is, as we look at risk, the more risk is probably remote consent. So if we’re still signing on site, and you have the site personnel there, probably decreases the risk. So I just want to jump in real quick with a 20-second promotional pitch. We talk a lot about eConsent, and our platform is TrialConsent, which is newly released. It sits along our entire TrialMax platform, which takes us from design all the way to management of your trial, including eCOA or ePRO data collection. What’s really kind of unique about TrialConsent—and Sam has been influential in our development in speaking to sponsors and sites and IRBs, just about every stakeholder—is that, for the very first time, you can either have a stand-alone eConsent solution or seamlessly integrate it with a full eCOA platform without having to use another vendor or use an additional layer of technology to fail. And also really exciting is the launch of our TrialConsent Designer, which for the very first time, again, allows a do-it-yourself or a full-service model for creating, developing, and collaborating on your eConsent without any programming skills, without bringing in other technical vendors. So that’s something that was really really desirable, and we worked incredibly incredibly hard to make sure that it met the needs of all stakeholders. 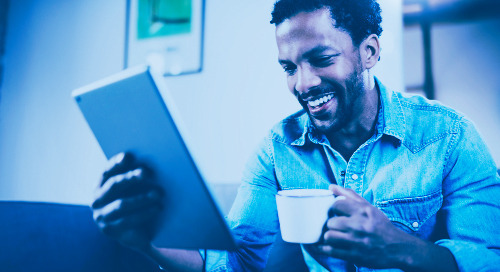 When we talk about our participant solution, you know, we’re all about delivering a really engaging digital experience with all the rich media that we talked about and knowledge checks and so forth. And finally, to make sure that you can manage your eConsent in real time with remote monitoring and re-consent management and these intuitive electronic dashboards that help you really understand the status of your consenting at a site level and at a trial level, and allowed to manage by exception. So that’s my [audio break at 30:57] schtick. Yeah. And Naor I wanted to just kind of go and elaborate a little bit about the TrialConsent Designer. And you saw that our survey results really valued to be able to design it yourself, and we know that the current development process of eConsent is quite laborious and some of the practices that occur with having to kind of go into paper first, then go into storyboarding, then go into actually putting it into a multi-media environment and getting approvals back and forth and getting—you know, some IRBs will want to have more than one approvals, you’ll approve paper and then you might approve it again. And we really promote that we’ll do it that way if you want us to but we really are promoting eventually the elimination of paper and that you can program your standard operating procedures and your regional requirements right within our Designer. So it’s not a documenting system, where you’re layering and you’re trying to present something that’s on a screen that’s going to look like a PDF of consent. It truly is, you do your multimedia storyboarding within the designer. And it remembers what you did, so you can really, again, you don’t have to be a graphic designer to create these. So up front, to put a system in place and learn it, is always that startup that we have to do. But then, we really wanted to design a system that didn’t just add stuff to the development of a consent, we wanted it to make it more efficient, just like the participant experience. You know, we can add video and all those kinds of things, so we know we can improve that for our participants. The main thing is, you know, I think some concerns out in the world are we know that some regulators have said we want shorter consents, and it’s the legal department not to have every word in the consent and you know, how you design that, we can actually help you. And then, remote monitoring of that TrialConsent Manager, and also other management stuff that— So it’s an exciting time, so we hope that you learned a lot from the survey information. Excellent. Well thank you both for a great presentation, lots of useful information there. Now I’d like to move into the Q&A portion of the webinar. 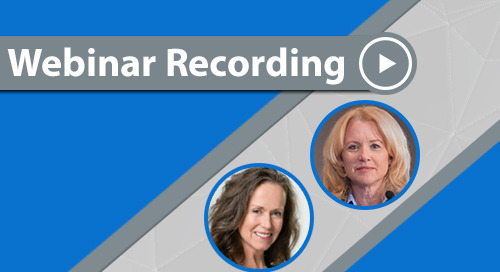 In this 45-minute webinar on demand we discuss benefits for patients, sites and study teams, address common questions, and present a brief demo to help you make eConsent decisions for your trials. 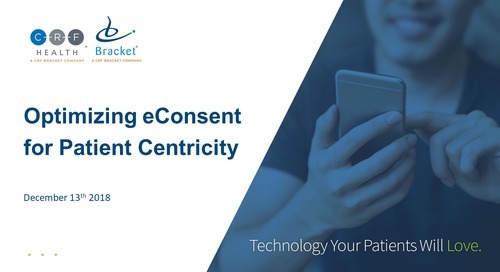 Experts from across the clinical trial industry share their data, real case studies and expertise on how to best support patient centricity through eConsent.